Michael Van Order in the lab at TU Dresden. Photo credit: M. Van Order. We chatted with MSE Ph.D. 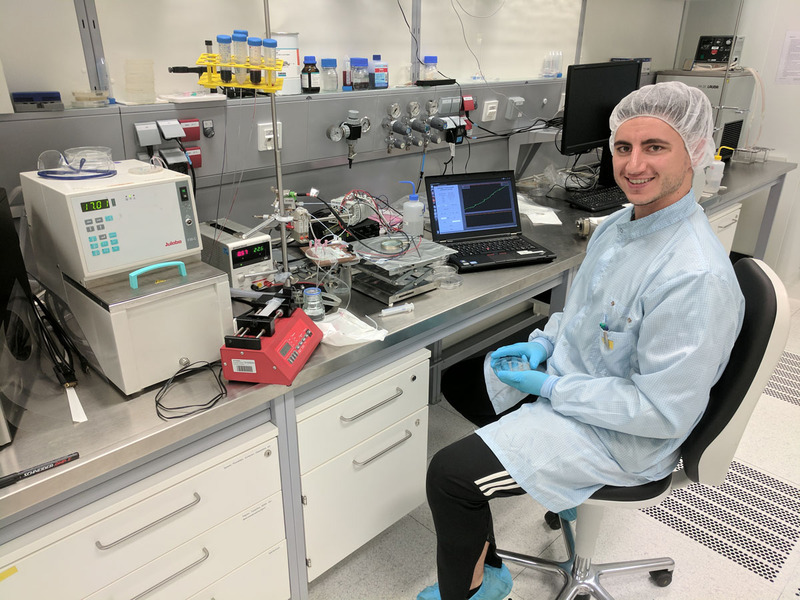 Candidate Michael Van Order to learn more about his experiences in the MSE graduate program, and how those experiences gave way to an internship at TU Dresden in Germany. So, this past summer, you interned at Technische Universitat (TU) in Dresden, Germany. How did you learn about this internship, and what prompted you to take part? My adviser, Dr. Alison Flatau from the UMD Department of Aerospace Engineering, has collaborated with Dr. Uwe Marschner of Technische Universitat (TU) Dresden on a number of projects involving the magnetostrictive sensing material, Galfenol. Dr. Marschner mentioned this internship opportunity, since it is sponsored directly by TU Dresden. I had never been to Europe – and regretted missing out on study abroad opportunities in my undergraduate studies – so I was quite eager to apply. Dr. Flatau was equally excited to send me over as we hosted Dr. Marschner's student, Maxim Germer, in 2016 for his Master’s research – this was a chance to bring our groups' history of collaborative research full circle. How did the internship relate to your studies at UMD? The research I performed at TU was based in materials science, but geared towards an electrical engineering application/project, which often go hand-in-hand in research. At the same time, my project in Germany focused on polymer science, which was an area of materials science that I’d never delved into previously. I do know a fair deal about the surface science of polymers, due to my Ph.D. research on the surface energy of metals, but this project used the bulk properties of a couple different polymers to make intrinsically active hydrogel valves for microfluidic systems. What role did you play at TU, and what was your favorite part of that experience? I mainly performed repeatability experiments on hydrogel valves designed for microfluidic systems. I was also involved in the fabrication of these cells, as well as future valve design modifications to improve the yield and longevity of the hydrogels. All experiments and analyses were done using Python coding language. Through my analysis, I found low correlations between measured data and modified parameters designed to improve valve functionality. I suggested multiple new valve designs to improve open/close cycling of hydrogels. My favorite part of this job was learning new experimental techniques from my experienced and reliable lab mates. Working with polymer materials is a very fast and inexpensive process that yields many results under varying conditions. The work environment provided by the Chair of Microsystems was extremely open and collaborative; everyone had a vested interest in each other's projects as well as a strong desire for the group to perform well as a whole. I very much enjoyed learning to properly use Python for data analysis and display – so much, in fact, that it has become my main programming language. How did UMD/MSE prepare you for this experience? Being part of both a Materials Science and Aerospace Engineering group, I often present my research to audiences without materials science experience, and vice versa. The way I form an explanation of my research had to change to convey information in a way that my audience could understand. Joining a German research group greatly magnified this challenge not only due to the language gap, but the cultural gap as well. One of my lab mates commented on my very American approach to presenting, where I was much more animated, yet sometimes too wordy for the audience. I adapted my presentation style to be slightly more direct and informational, while still maintaining my spirited tone. The MSE department itself has helped me become very thorough in my research even when I’m unfamiliar with the topic, for example, with the Ph.D. qualifying exam. This showed in my final internship presentation – when I was personally thanked by the Chair Holder of the Microsystems group – for my level of detail and data provided during the summer. They will, hopefully, be able to publish a few journal articles from my work. The UMD International Affairs Office was essential to the completion of my internship application. Dr. Joseph Scholten and Conrad Zeutenhorst very quickly provided international insurance paperwork and recommendation letters to guarantee my eligibility for the German internship. UMD quite clearly wants its students to go abroad – and for good reason. I should also add that the UMD Graduate School and MSE Department was able to help me financially during this trip by giving me the International Graduate Research Fellowship award. This was a very quick process that could not have been completed without the help of Ms. Robyn Kotzer and Dr. Ray Phaneuf. Do you have any advice for other MSE students? Apply to any international opportunity available! I was too hesitant as an undergraduate to apply for any study abroad opportunities because I thought it could not work for a student in a scientific field. I regretted that decision and was very lucky to come across this chance later in my academic career. There are plenty of campus resources to help you experience another culture abroad, and UMD is more than willing (and able) to give them to you, so don’t let any fears you have hold you back! What are your post-commencement plans? My plans post-commencement are to find a job in an industry position working with a highly collaborative staff. I hope to one day lead my own groups in a managerial role so that I can communicate project goals with both technical and managerial staff. Michael has a B.S. in Physics from UMBC and a M.S. in Physics from the University of Pittsburgh. He is expected to complete his Ph.D. from UMD in May, 2018.